The IT management profession is not for the faint of heart. Anyone who has worked in this field is familiar with the unique (and borderline impossible) challenges of keeping pace with technological innovation while maintaining legacy systems, reskilling existing staff members and operating on shrinking budgets. 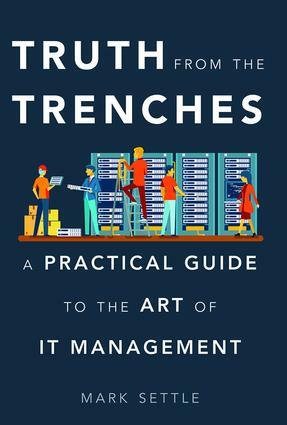 Truth from the Trenches passes on the hard-won leadership lessons that six-time CIO Mark Settle gained over years of working in IT management. Settle describes the key constituencies that an IT leader needs to influence, seduce, leverage, and manage to be successful. His practical recommendations will allow readers to improve their organizational impact and accelerate their career advancement. In a sector where competency stems not from formal certification but on-the-job learning, Truth from the Trenches is a valuable and unique resource that is based on Settle’s deep experience working in a wide variety of industries. By applying Settle’s strategies, IT leaders will be able to avoid common pitfalls, save themselves from wasting time and on hopeless initiatives, and successfully do battle with the people issues, financial challenges, customer problems and technology opportunities they confront on a daily basis.